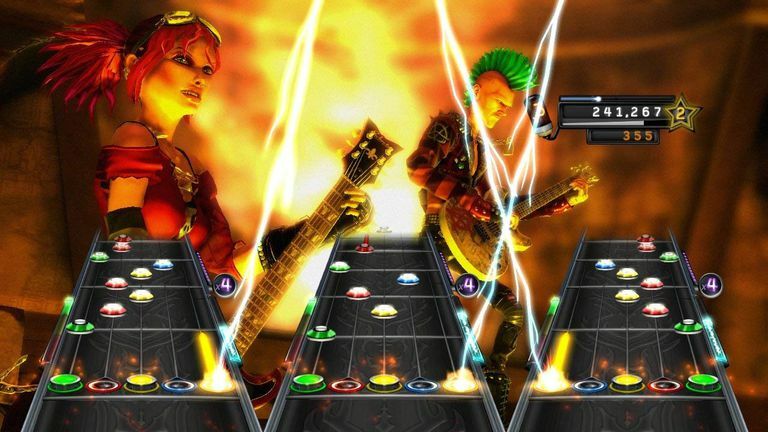 The last few Guitar Hero games have had watered down song lists to try to appeal to everyone, but Warriors of Rock goes back to the series' roots with a tracklist made up almost exclusively of hard rock and heavy metal. The game is unfairly blamed for the downfall of the music/rhythm genre after 2010, but it wasn't this game's fault. Guitar Hero: Warriors of Rock is awesome! It has a great rock / metal-focused tracklist, challenging gameplay, and is a real treat (as long as you are fans of this music, anyway). The presentation is a little over the top and goofy, though, and the included guitar isn't very good. But it is fun, darn it! Compatibility With Guitar Hero LIVE? Because of the fact Guitar Hero LIVE has a new gameplay style and a new six-button guitar, tracks from Guitar Hero: Warriors of Rock, or any other past Guitar Hero games, will not be compatible with it. This is a bummer since Rock Band 4 is compatible will almost all of the previous DLC for that series. Are Your Favorite Artists in the 'Band Hero' Song List? Which Songs are Included With Rock Band 3?